CNC(Computer Numeric Controlled) Machining Techniques is most common way to produce various of metal and plastic parts processes. 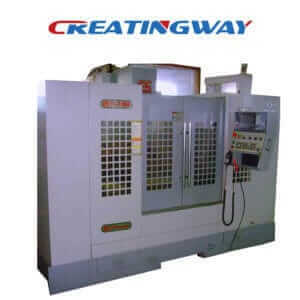 Even though there are many new and innovation manufacturing process used into our current production such as 3D printing, casting vacuum, rapid tooling etc but CNC machining still will be easy and convenient to our workings, We will further share top 8 CNC machining techniques and their advantage and weakness as well as their working performance. Milling is one of CNC machining techniques that it is used to remove stock from complex and more asymmetrical parts. It is the process of creating: squares, channels, notches, profiles, chamfers, and other shape or features that require precise angle cutting. During the milling process, the cutting piece is made to rotate on a spindle and the workpiece is held in a horizontal manner in a machine vise. The workpiece remains stationary during the cutting process while the table on which the machine vise is fixed moves in a Y and X directions. The cutting tools and the workpiece are cooled using a cutting fluid. The cutting fluid is also used for the needed lubrication and flushing of metal particles. Unlike milling, we need to hold fixed the workpiece on vise during turning, and will use clamp to fix the parts firmly on a rotating mandrel or plate. The workpiece moves. The cutting tool is fixed on a moving slide against the workpiece. The slide that holds the cutting tool can be adjusted along the workpiece or across the center away or near the centerline. This process removes a large number of materials faster. Further, precise holes are drilled down the centerline of the workpiece during the process using a drill bit. Lathes are used during turning. They are combined with some other accessories and tools to carry out a large range of operations. They are usually used to create concentric shapes. They are also used to turn bars to length, correcting diameters and drilling holes. They are used to make circular parts like knobs, cylinders, and bolts. Lathes produce smooth and uniformed finishes. Surface grinding utilizes the services of a grinder to make extremely flat surfaces on metal parts. The grinder is technically a spinning disk that has abrasive grit on its surface. The process of surface grinding involves mounting the workpiece on a table and moving it over or beneath the grinder. Alternatively, the workpiece can be held firmly in place as the grinder moves over it. Surface grinding technique can be used only on materials that have uniformed surface. Different grinders are used on different materials. It is also very important to watch the temperatures during this process. Optical grinding is the technique of making special optics in glass or plastic. Optics need fine surfaces and definite precision. Optical grinding requires special equipment that rotates on multiples axes while spinning the grinding wheel on a chosen surface. This exercise leads to the averaging out deviations that were away from the normal. The optical grinding process necessitates the use of the grinding paste to lubricate and to achieve a polished finish. Cylindrical grinding combines the techniques of turning and surface grinding. During cylindrical grinding, a circular grinding wheel rotates against the surface of a workpiece held on a stationary position. The circular grinder can be moved through the whole length of the workpiece, on the outside or inside diameters or on its partial lengths. This process produces accurate and precise tolerance and an extremely smooth textured finish. This is where a workpiece that is soaked with dielectric fluid joined with a conductive electrode. As the electrode discharges, metal particles fall off from the workpiece creating a shape of the electrode on the on the surface of the workpiece. The electrode is shaped into a desired shape before the process beginning. As the process continues, the electrode is exhausted and will need frequent replacement. Solid sink EDM is only used when no other machining process can effectively work. It used mainly to make square features, holes or pockets inside hardened steel tools. The Solid Sink EDM is commonly used on molds for die-casting and plastic injection. It is also used to make logos and recessed letters on mold tools. Just like the Solid Sink EDM, Wire EDM is only used where no other methods are practical. The process is used on thick and hardened steel tool to make semi-circular or circular features. It is very common CNC machining techniques in our industries. During the wire EDM, copper wire is used as the conductor as opposed to the electrode. As the copper conductor is eroded during the cutting process, it is directly replaced from a feeding spool. Wire EDM requires a clear pass through as it is not effective through a blind hole.